This Clyde skirt embodies the creative, casual style of the American brand rag & bone. Designer Marcus Wainwright drew inspiration from cinema when crafting this bold piece, the feminine cut makes it perfect for pairing with sneakers and sandals. 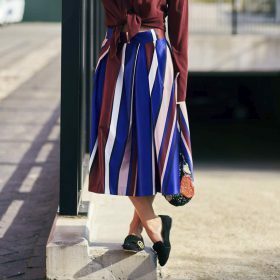 Discover why we love our women's midi skirts as much as we do! There are plenty of reasons to love these midi skirts. They're right in the middle, perfect for so many occasions where you need something a bit fancier than a pair of jeans, but not too dressed up at the same time. Pick your favourite strapless top or crop top to wear with your midi skirt and have a look at our loafers category to find footwear that will finish off the look. The possibilities are endless, so style away!